Beauty Costs > How Much Does a Sapphire Cost? How Much Does a Sapphire Cost? Sapphire, a gemstone commonly worn as jewelry, is found naturally by searching through certain sediments, rock formations, or it can be manufactured for industrial or decorative purposes in large crystal boules. Sapphires virtually come in every color under the rainbow, except for red. While a blue sapphire is simply called a sapphire, a sapphire of other colors will be referred to as a yellow sapphire, pink sapphire and so forth. The beautifying colors com from traces of iron, chromium and titanium. The price of a sapphire depends on the quality and size. Lower grade sapphires are considered to be the cheapest form of the stone, while very fine unheated sapphires are considered to be the most expensive. A sapphire can cost anywhere from $10 to as much as $20,500 per carat depending on the number of carats, the type, cut, color, hue, quality and who you purchase it from. Most inexpensive sapphires, where lower grade sapphires are fashioned into ornamental gemstone carvings, can cost as little as $1 to $6 per carat, depending on the quality, but most will be priced by the piece, not by weight. Most pieces on the market will be about $10 to $25. Sapphires cabochons, which will often be blue or green, will around $10 per carat, and these pieces will be shaped like a dome and won’t be transparent. Higher quality blue sapphires, however, can cost much more. Star sapphires, which are also found as a cabochon, often come from Thailand, and will be diffusion treated with titanium to approve the “star effect.” These types of sapphires will cost about $10 to $25 per carat; however, larger sapphires can be costlier, especially if they weren’t treated. Faceted sapphires, which are often under a half carat, can be $25 to $35 per carat, depending on the color and the size. These sapphires will usually be green in color but can be yellow and reddish orange as well. Heated blue sapphires, depending on the hue and clarity, can cost as much as $300 to $600 per carat; again, this will all depend on the color selection and the number of carats. The Gem Society says the closer the color is to blue, the better. The society also says many gems on the market are actually grayish and the darker sapphires are abundant, never reaching higher values, but this can be said for all darker gems. MineralMiners.com, for instance, sells different types of sapphires with different weights and colors. They sell sapphires that weigh anywhere from 1.72 to 2.17 carats in size and costs range anywhere from $275 to $2,000. The table below is what you would more than likely pay for an unheated sapphire, which is extremely rare to find at local jewelers. 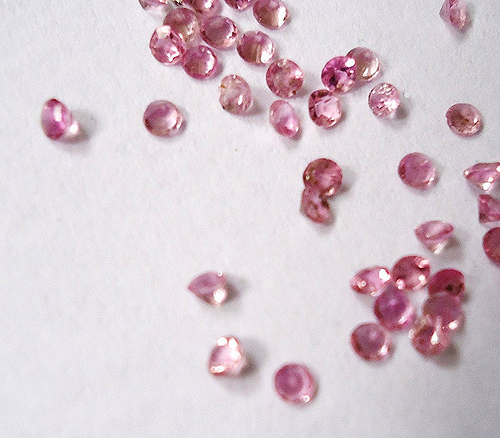 The costs of these unheated gems will depend on the size, cut, shape, colors and size. Gemselect.com says any fine unheated sapphire of any size will never be less than $1,000. If you would like the sapphire set in a piece of jewelry, such as an engagement ring, the price will depend on the size and type of setting. Sapphires will come in blue, with the highest being a princess blue, but the most prized color will be a royal blue. A blue sapphire can either be pure blue or it can have a tint of green or purple. By value, as stated above, the “purer” the blue is, the more valuable it will be. Aside from blue, sapphires can also come in other colors such as pink, yellow, green and yellow. Most sapphires on the market will be heat treated, meaning the sapphires were heated under high temperatures for hours to enrich the color of the stone. Where the sapphire originated from can affect the price of a sapphire. For example, a sapphire mined in Mogok or Burma will be more than one that was mined elsewhere. Be on the lookout for an official rating from the GIA. VVS, VS and SI1 stones will have very few inclusions, and these inclusions won’t affect the brilliance of the tone. SI2 stones will have inclusions when observed under a microscope and will have a minor effect on the stone. I1, I2 and I3 ratings will have surface blemishes that are noticeable by the naked eye. When purchasing a sapphire in person and online, always work with a reputable dealer. A national chain, for instance, is a good place to start, since they have to follow strict guidelines. If you do work with a local jeweler, be sure to ask for a certification from the GIA or an independent gemstone society to know they are qualified to sell. The first thing you’re going to want to look at are the flaws. Most real stones will have some sort of flaw and won’t be perfect 99 percent of the time. To see these flaws, you will need a jewelers loupe (magnifying glass) to see these inclusions. Another thing to look out for is the reflected light and a lot of intersecting lines, similar to a spider web. If you notice this pattern, while under a microscope, it could mean the glass is holding it together. Lastly, the easiest test is simply by breathing on it. Breathe on it for about one second, and if you see the fog evaporate fast, it’s real; if it takes longer than five seconds, there’s a good chance it’s a fake.